Eleanor of Aquitaine was intelligent, well-educated, well-traveled, charismatic, and powerful, and today she is one of the most well-known women of the twelfth century. 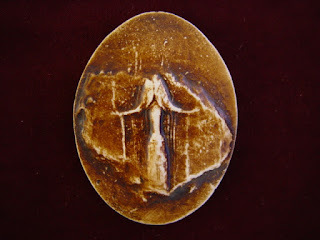 She lived in a time of of remarkably gifted and memorable women, many of whom I have posted about already this year: Urraca of León and Castile, the Empress Matilda, Melisende of Jerusalem, Heloise of Paris, Anna Comnena, Hildegard of Bingen . . . I am assuming that the broad outline of Eleanor's life story is familiar--born between 1122 and 1124, she was heiress to her father's county of Poitou and his duchies of Aquitaine and Gascony, a vast territory that occupies more than one-quarter of modern France. She inherited this wealth and power after her father's death in April 1137. By July, she was married to Louis, the son and heir of King Louis VI, who promptly died in August of 1137, so that, within four months of her father's death, Eleanor, duchess of Aquitaine, was queen of France. She bore the French king two daughters: Marie of France, born in 1145, and Alix of France, born in 1150. She traveled with Louis on the Second Crusade, from 1145 to 1149 (her eldest daughter was born right before Eleanor departed for the Holy Land, her younger daughter on her return). While on Crusade, and before the birth of her second daughter, Eleanor decided that her marriage was invalid and sought an annulment on the basis of consanguinity. Although her request was at first rejected (by Pope Eugene III), after a second daughter was born, leaving Louis still without a male heir, an annulment was granted on 11 March 1152. After fifteen years, the couple's marriage was declared invalid--although their children were declared to be legitimate. Eleanor remarried almost immediately. On 18 May 1152, she married Henry, duke of Normandy. In 1154, he became King Henry II of England, with Eleanor's coronation taking place on 19 December. And, interesting to note: the marriage of Eleanor and Louis was annulled because, as third cousins once removed, they were too closely related; Eleanor and Henry were also third cousins. The marriage was productive, certainly--with Henry, Eleanor gave birth to five sons and three daughters. It was also tumultuous; as I've noted elsewhere, Henry had Eleanor imprisoned for sixteen years, between 1173 and 1189. But after Henry's death on 6 July 1189, Eleanor was freed and resumed a rich and full life. She was regent of England for Richard when he left on the Third Crusade later in that year, and she negotiated his ransom and release, traveling to Germany to meet with the Holy Roman Emperor in order to secure his freedom on 4 February 1194. After Richard's death, her youngest son, John, became king of England. She served and advised him until her death on 1 April 1204, when she was in her eighties. I could write an impossibly long and detailed post about Eleanor of Aquitaine, since her life seems to have taken on mythic (and frequently fantastical) proportions, but, instead, I thought I'd a few details about some of the other women in her family--other women who add more to the on-going discussion of family values and traditional marriage in this blog. While his wife Philippa was occupied in Toulouse, William had moved his mistress into the Maubergeonne tower of his castle in Poitiers--thus earning Dangerose the nickname La Maubergeonne. When Philippa returned to Poitiers from Toulouse, she found that her husband William refused to move his mistress out. Despite appeals to secular and spiritual authorities, no one came to Philippa's aid, and she spent the last two years of her life in the abbey, from 1116 until her death on 28 November 1118. The death of Philippa of Toulouse brought another inconvenient woman into the picture--Ermengarde of Anjou. Many popular biographies of Eleanor of Aquitaine assert that Ermengarde was William IX's first wife--one whose marriage was dissolved after two years--but scholarly opinion seems to cast grave doubt on that part of the story. But Ermengarde of Toulouse does seem to have been in Fontevrault when Philippa arrived, and after Philippa's death, Ermengarde seems also to have demanded of the Council of Reims that it once again excommunicate the duke of Aquitaine and force him to renounce his mistress. That did not happen. In the mean time, the duke and his mistress arranged for the marriage of his son, William, to her daughter, Aenor de Châtellerault, in 1121--in this example of "traditional" marriage, then, Eleanor's maternal grandmother was her grandfather's mistress . . . Despite the fact that Raoul of Vermandois had been married to Eleanor since 1125 (and she had dutifully given her husband a son and heir), and apparently with Eleanor of Aquitaine's encouragement and support, Raoul was able to annul his marriage and replace his first wife with Petronilla. Theobald of Champagne, the brother of Raoul's rejected wife, went to war over the insult to his sister--a war that lasted for two years, from 1142 to 1144, and that drew Louis into battle and, after the fiery and bloody sacking of the town of Vitry-sur-Marne, was said to "haunt his days and nights" and to have broken his spirit. Meanwhile, Theobald had offered his abandoned sister his protection, and he protested to Pope Innocent III, who excommunicated both Raoul and Petronilla. The excommunication was lifted, the pope ordering Raoul to give up his relationship with Petronilla. After Raoul refused, he and Petronilla were excommunicated for a second time. 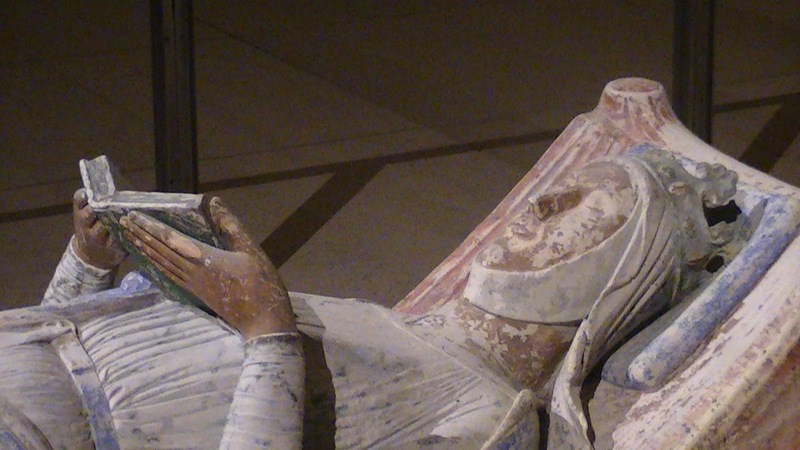 As for the next generation, I've already noted, in a post earlier this year, about Eleanor of Aquitaine's journey with Berengaria of Navarre, who married Eleanor's son, King Richard "the Lionheart." Eleanor's eldest daughter with Louis of France, Marie of France, married Henry of Champagne. Interestingly, Henry of Champagne was the brother of Louis' second wife, Adela of Champagne. In other words, Marie of France was married to her stepmother's brother. And oh, by the way, Queen Adela and Marie's husband Henry were the children of Theobald of Champagne--the same guy Louis went to war with over the Raoul and Petronilla affair. Eleanor's youngest daughter with Louis of France, Alix of France, married Theobald V, count of Blois--who was also the brother of her father's second wife, Adela of Champagne, and of Henry of Champagne, her sister's husband. Eleanor's daughters with Henry were Matilda of England (born 1156), Eleanor of England (born 1162), and Joan of England (born 1165). Eleanor of England was married to Alfonso VIII of Castile, becoming queen of Castile--by circumstances and undoubtedly by her own strengths, she wielded great power and influence in Castile as queen. Her daughter Blanca of Castile became queen of France--and, as I've noted in an earlier post this year, in 1199, when Eleanor of Aquitaine was in her late 70s, she traveled to Castile to select one of her granddaughters as a bride for Louis, the son of Louis VII. She was ambushed and held captive on her trip, but the indefatigable Eleanor negotiated her release and arrived in Castile in January of 1200. Joan of England, Eleanor's youngest daughter, was married to William II of Sicily in 1177 and was crowned queen of Sicily. After William's death in 1189, as I've noted in an earlier post, Joan was imprisoned by her husband's successor, Tancred. Ultimately released by her brother Richard, as he stopped in Sicily on his way to the Holy Land, Joan accompanied her brother and his wife, Berengaria, on the Third Crusade. Richard toyed with the idea of marrying his widowed sister to Saladin's brother, setting the two up as rulers of Jerusalem, but that plan didn't work out. Instead, Joan married the much-married Raymond VI, count of Toulouse, in 1196. This was not a happy marriage; nevertheless, while he was away fighting, a pregnant Joan had raised an army to counter a rebellion against Raymond in Toulouse. She was betrayed by some of her own men, barely escaping with her life. She had ridden north to seek help from her brother, King Richard, only to learn of his death while she was en route. She turned to her mother for assistance and wound up in the abbey of Fontevrault. She died in childbirth there, just thirty-three years old. There are many biographies of Eleanor of Aquitaine, quite a few popular and exciting, some fairly scholarly. I'd recommend the chapter on Eleanor in Lisa Hilton's Queens Consort: England's Medieval Queens, but if you're really looking for more--by which I mean something of the mythologizing of a life that really needs no embroidering, I'd take a look at Michael Evans's Inventing Eleanor: The Medieval and Post-Medieval Image of Eleanor of Aquitaine. It's hideously expensive--interlibrary loan?--but really excellent. There's a wonderful selection of letters to and from Eleanor of Aquitaine at Epistolae: Medieval Women's Latin Letters.